It'll run soon. I have since determined that the TFI system is in fact functioning by pulling the dizzy out of the engine, and spinning it by hand with the ignition turned on. I do get spark, and the fuel pump runs appropriately, however, I am not seeing spark at lower speeds, so it's possible that my OE style starter, combined with the 4 year old battery and sub-freezing temps is just not spinning the engine up fast enough (it's only spinning at between 100 and 150 RPM under cranking right now). More diagnostics and testing is required. Still, despite the fact that I have not heard it even cough yet, and I only hit the later of my two target dates, I am optimistic that I will get it to fire up this week, and it'll be ready for test driving by Christmas. It's going to be a trial by fire for the car and the EFI system, since I intend to drive it the 200 miles up to my parents place for Christmas. I'll also note that except for yesterday, the last day of working on the car, I had no help whatsoever doing this; it was a solo design, install, and fabrication. My father did stop by yesterday to help me finish up the last of the wiring, as well as to help reinstall a the handful of fasteners that are very difficult to install without two people. If I get to a point where I can verify that I do have an ECU or tune issue, I'll be sure to hit you up for help. Bone: the hoseclamps on the spring tower support are because the support is a home-made piece made from the draglink of a Jeep XJ, and the length can be tweaked slightly to spread or pull the spring towers. The adjustability is really just to make it easier to install and remove, since it mounts to studs on the spring-hats (i should have just welded nuts to the underside). The hose clamps squeeze down on the ends, and stop the bar from being able to spin on the threads. I should replace those with a proper means of locking down the threads, but its been hose clamps for the last several years, and I've never had them loosen up, so I haven't bothered. The P-Clamps (also called cushion clamps) on the support used to be used to support the engine wiring harness, but now that it's routed differently, one of those sets is no longer used, and the other is being used to support the air intake tube. It's maybe not the best solution for the intake tube, but that intake is not really in the best place anyways, and it will change when I eventually do the shaker intake later anyways, so the P-clamp support will do for now. 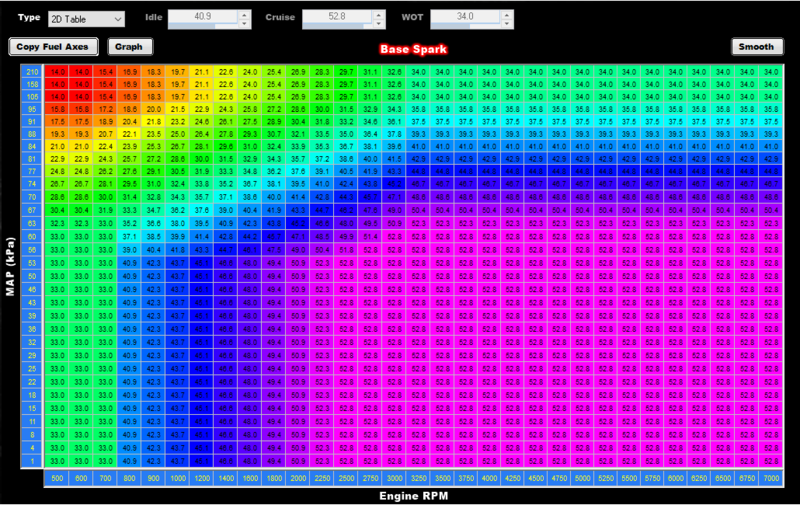 Try lowering "Crank to Run RPM" unter "Spark -> Cranking Parameters". Default's 400, I think. It also might be possible that the signal of your dizzy is so weak at lower speeds that the ECU interprets it as noise and ignores it. Check "Minimum Signal Voltage" under "System Parameters -> Engine Parameters". Lowering this, of course, is a stopgap as it might lead to faulty RPM readings while running. EDIT: Come to think of it, the weak dizzy signal theory is the one you should check first as crank to run should not influence spark. I have also tested a handful of injectors (the ones I can get to somewhat easily) with a noid light, and verified that way that the injectors are getting power appropriately. Additionally, I have verified that the Fuel Pressure Transducer is in fact wired correctly all the way from the transducer to the ECU, and the ECU is expecting the Holley 100psig transducer, which is what I have, and what I am also using for oil pressure, which works. No fuel pressure reading in the ECU though. The transducer in installed into one of the "in" ports for the fuel pressure regulator. Fuel system is electrically verified to work. Fuel pressure exists, but not sure how much there is. that's where the option is. however, since the last post, I have converted the car to a PMGR starter from a 93 bronco application. Doing so has been low priority on the to-do list for a long time, but the low cranking rpm tipped me over the edge, so I went and bought a reman unit and put it in. Cranking rpm is now 140-150, and the timing light now triggers when the dizzy is installed in the car. If you have headers and they're not ceramic coated, you should get the Ford factory heat shield for the PMGR starter (F4TZ-11006-A) at a minimum or you may end up with an unwanted surprise when you get it running (depending on your exhaust routing). TIL Holley shuffled a bunch of Options around when stripping the Software down for the Sniper. Minimum Signal Voltage is only available for Magnetic Trigger ignitions, so that does not apply to you, either. But you got spark! That's all that counts for now! EDIT: The reference angle looks weird to me, by the way. At least with the Sniper, max spark advance is 10° less than the reference angle, limiting you to 0° of advance. First - some theory (skip this paragraph if easily bored - instructions follow): The Sniper's software is derived from Holley's upmarket EFI systems that (can) use a crank sensor to trigger the ignition. That's where the "reference angle" comes from: It tells the Sniper how many degrees before TDC your crank sensor is installed. As you can imagine, you can simply turn a crank sensor to any setting you desire, so making this freely configurable makes sense. Only - the Sniper does not use a crank sensor, but the trigger inside an MSD or GM HEI dizzy. Thus, each time you change the reference angle, you have to turn the dizzy accordingly as both the signal to the Sniper and the spark are related to the dizzy turning. Which brings us to rotor phasing: Electronic timing control means that, as the Sniper sets the timing, the dizzy's rotor will not be exactly lined up under the spark plug terminal like on a classic distributor. This means you have to "phase" the rotor, making sure it is lined up with the spark plug terminal when you need the strongest spark: At peak torque, which with most engines means at or close to your maximum high-rpm WOT advance. So, what does that mean for your dizzy install? As explained, there is a direct relation between the reference angle as set in the Sniper Handheld and the phasing. The phasing instructions in the Sniper Manual, if they make any sense, only work with the preset reference angle. Mark the #1 spark plug position on your dizzy base (cheaper than cutting a hole in a cap), change the reference angle, re-set the timing on the dizzy to match the Sniper, turn the crank to TDC, remove the cap and observe how the rotor position changed. You will notice that for every 2 degree of reference angle change, the rotor will move by 1 degree. As mentioned, you want to have the rotor to pass directly under the spark wire connector at peak torque, so most likely at or around your WOT maximum advance (remember, 1 degree dizzy advance equals 2 degree crank, so if your engine wants 35° at WOT, you want the rotor to be phased by 17.5°). So, your task is to find a combination of reference angle and rotor phasing that puts your rotor there. The by the book way to do it is to set the reference angle to 10 degrees more than your maximum advance (if you want to see 55° at high rpm cruise, set the reference angle to 65°) and then adjust the rotor to match the desired phasing. So, per this post on the holley forums, I think that the reference angle functions differently with the ECU having full timing control. Anyways, I worked on the car till nearly 11pm last night. For whatever reason, when I first cranked the engine after swapping the starter, I could clearly see the timing light flashing, indicating spark. When I got out, and set up my external solenoid switch so that I could crank the car from outside, as well as unplugging the injector harness, the timing light would not flash anymore. Nothing I did could get it to flash again. So, just because the light is not flashing, does not mean I don't have spark anymore. In lieu of pulling a plug, grounding it to something, and watching for spark (which is what I have always done in the past), I think I am going to stop by the new local harbor freight, and pick up a $5 in-line spark checker; seems like it'd be a decent tool to have anyways. I suspect something like the dizzy being 180 out though, that, or the timing is just so grossly far off, that it wont even attempt to run. As for the starter heat-shield, It's ordered. Part of the reason I've wanted to do this swap for a long time is because of the tendency for the old direct-drive starters to not be very happy about header heat, so even though the PMGR starters are better, adding an additional heat shield seems like a fine idea to me. Beware of Danny's posts, they are contradictory! This post: https://forums.holley.com/showthread...p-Instructions linked from the one you linked, is back at "10° more than max advance". I run full timing control on the Sniper as well. You'll find out what is true for your setup as soon as you get a steady enough spark to set base timing. Honestly, I don't know what is, since the magnetic trigger I am using is different to your dizzy and the posts on the Holley Forums are inconclusive. In any case, there is a direct connection between reference angle and dizzy positioning that may influence your engine to the point of not starting. Remember to set the inductive delay as well... can account for several degrees of extra timing at high RPM if wrong. Of course, the timing is all kinds of screwed up, and it idles high. I'm sure there is some simple thing that I am missing, since Danny's post over at Holley is.. less than perfectly clear lol. I'll be doing lots of research tomorrow to try and really hammer down how to set initial timing, and sync the TFI physical timing to the Dominator ECU timing. As for how I got it running, well, it involved no small part of stupidity on my part. Generally, it was a fueling issue. Turns out, the 0 psi reading that the fuel pressure transducer was telling the ECU was, in fact, correct. I bought a mech gauge, verified that I did, in fact, have no fuel pressure, and in the course of my investigations, I first started messing with the FPR setting, which unveiled a huge fuel leak at one of my AN fittings (the first one I made, had a bad flare), and I later uncovered that I had made a mistake. As I was making the fuel lines, at one point, I was very, very sure of which line was which, I had checked it over and over. At one junction, I realized that I had screwed up, and switched the sides the lines were on, so I made a crossover. Fixed that, and boom, fuel pressure, then it started right up. Good on getting it to start, but getting it to run properly is your next challenge and you're not quite there yet. Getting it tuned properly is something that can take quite a while - been there, done that, got the T-shirt. What's the IAC status with that high idle? EDIT: Regarding setting timing, it's a simple process and can even be done at 3000 rpm idle. a) You set a static timing with the handheld controller. 15 or 20 degree, does not matter, as long as you have a matching mark on your balancer. Be careful, at least with the Sniper static timing is erased when you leave the menu item or turn off the engine. b) You use a timing light to set actual timing to the same value you put into the controller. 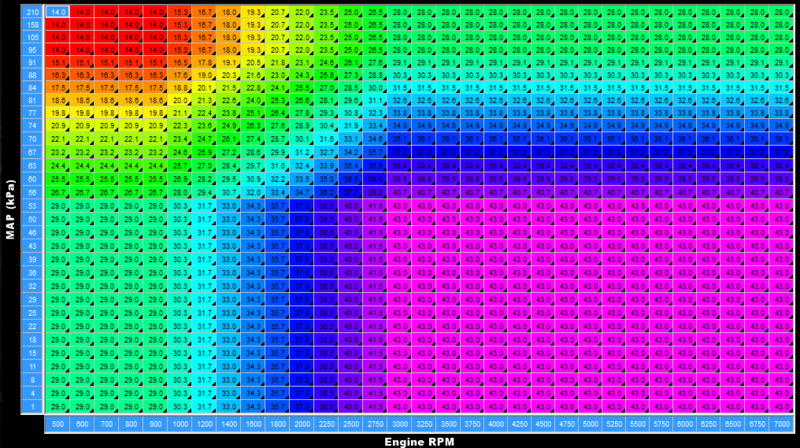 c) Once you figured out idle, check whether the static timing stays consistent across the rpm range. If it changes with engine speed, adjust inductive delay (may not be needed with your dizzy, but it does not hurt to check). I ran the car a bunch of times last night, trying to figure out what was going on. From looking at the data logs, it looks like the idle RPM varied from 500 rpm with 0% TPS, and 100% IAC, (and glowing headers) up to 3050 RPM, with 0% TPS, and 40% IAC. We'll see if I can get the timing to behave when I get home from work and can start playing with it. I think I understand how the process is supposed to work, I just was not getting the expected results last night. Also, I forgot to mention in the last post, but on the last couple runs, I discovered that the alternator is not charging either. It's a fresh 3G upgrade, that is getting key-on power from a key-on terminal strip. (the same one that provides key power to pretty much the whole car) I'm reasonably sure it's wired correctly, but I need to double check, and verify before I go any deeper trying to figure that one out. Is the timing you see with the timing light at least in the same ballpark, ideally exactly matching what you see in the log? Remember, the log does not know how much timing you actually run, only what the ECU thinks you run. For reference, here's the timing table I ran with stock iron heads and here's what I intend to run with the CHI aluminum heads. Was this the diagram you used to connect it? You may find that you need to change the voltage input on the I terminal - it may be expecting to see the reduced voltage caused by the charge light or gauge. Wow, Fords have a mega fuse? What is a mega fuse? Is that like a fusible link? I don't think I used that exact diagram, but yes, that is how I wired it. I'll look into getting a resistor to splice into the wire. For what it's worth, the light in the dash is no longer connected into the charging system. I have the ECU set up to trigger the light when voltage is below a certain amount. Dr Grip: The timing light was considerably far off from what the ECU was commanding the timing to be, and attempting to adjust the dizzy to match, was what caused the RPM to climb from the initial 1200 rpm idle, up to over 3000 before I stopped, thinking something was going wrong. Additionally, When I set the dizzy into the block, I preset it to a location that should have given me somewhere in the ballpark of 15° of initial timing, and I was having to move it an awful lot to get the timing light to even be remotely close. We'll have to see what happens when I start wrenching on the car again this afternoon. I won't be dead tired and freezing (at least when I start), so I am expecting to be able to get this timing thing figured out.